In my days spent at home I have spent some time browsing etsy for prettiness to fill me day. Here's a few butterfly loveliness that has caught my eye. 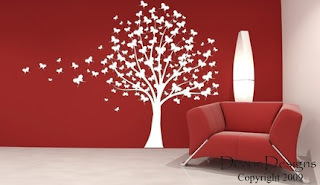 First this wall decal - I order it! So yummy scrummy! I would love to get some decals for the flat!! On my wish list. This is from Decor Designers. 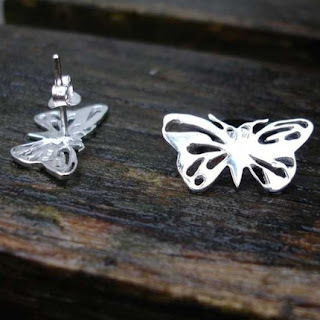 These earring are divine! Simple and pretty, reminds me of the Martha Stewart monarch butterfly punch! These are from beautyuncut. 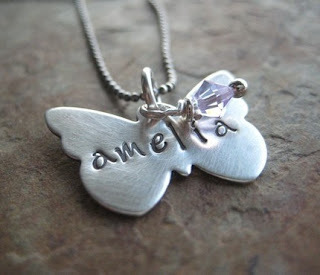 This necklace is so feminine and pretty, I may need to purchase one once baby is here! 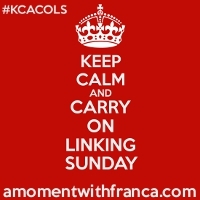 This is from CindyPack. And finally some pretty paperness. I would love to recreate both of these, may take a bit of planning and a borrowing of a slice with a design card with butterflies!! 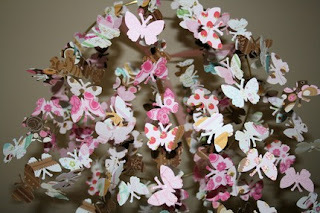 First this mobile is fully loaded with butterflies! oh so pretty. This is from littledreamerinc. 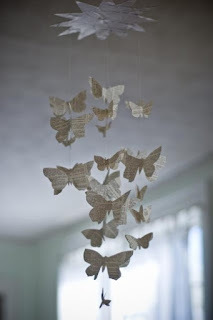 And a simpler butterfly mobile using vintage book pages and wire.....stunning. This is from Royal Buffett. That's it from me. Enjoy the weekend bloggers! Oh also thanks so much for the comments on my letter to Baby, I'm really pleased I was able to record my feelings and fears and love for my little one. I'm officially now 2 weeks til due date. Fingers crossed! oh wow that wall decor is amazing! Oh WOW I love those wall arts. I will be looking into those further when I have decorated our lounge. Infact I might have to look into them for every room. Thanks for sharing. Having time to kill rocks....I love browsing Etsy for pretties. I adore that necklace and may have to buy one for my 'something new' on my wedding day. It is so pretty, thanks for sharing. Two weeks eh, not long at all really. Rest up, rest up and rest up.....seriously. Oh and do a little cook off and store in the freezer.